Android Oreo (Go Edition), also simply called Android Go, is Google’s solution to the growing importance of emerging markets where budget devices reign supreme. Android Go is Android 8.1 Oreo optimized for low-end hardware; it’s basically just a set of build configurations and special Go edition applications designed to run on hardware with as little as 512MB of RAM. The (now defunct) ZTE Tempo Go, Alcatel 1X, Nokia 1, and Nokia 2.1 are just some of the budget phones running Android Oreo (Go Edition). For developers looking to get new users, it’s important to optimize their apps to run on low-end hardware. But if you have no interest or cannot reasonably optimize your app to run on Go edition devices, then you’ll be happy to know that the Google Play Console now lets you add exclusion rules to prevent your apps from being downloaded on them. Users can still side-load your APK, though. If you simply wish to prevent users on budget hardware from having a poor experience with your app (and thus rating your app poorly), then this is a quick way to prevent that from happening on at least a small subset of budget devices. Still, it’s better to optimize your app as much as you can anyway because the majority of Android users are on budget hardware. 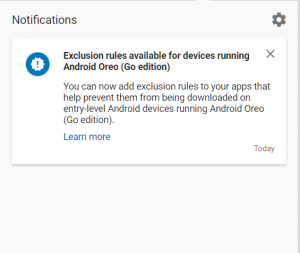 If you wish to set up device exclusion rules for Android Oreo (Go Edition) devices then here are the instructions on how to do so, copied below from Google’s support page. The instructions also tell you how to exclude users based on passing SafetyNet Attestation APIs (just like Netflix), but we really hope you don’t have to resort to that. Sign in to your Play Console. On the left menu, select Device catalog. Select the “Excluded devices” tab. Next to “Exclusion rules,” select Manage exclusion rules. Don’t exclude devices based on SafetyNet Attestation API: Selected by default. Exclude only devices that don’t pass basic integrity: This helps you determine whether the particular device has been tampered with or otherwise modified. Exclude devices that don’t pass basic integrity, as well as devices that are uncertified by Google: This helps you determine whether the particular device has been tampered with, otherwise modified, or hasn’t been certified by Google. Don’t exclude Android Go devices: Selected by default. Exclude Android Go devices: Prevent devices running Android Oreo (Go edition) from installing your app on Google Play.